These invocations to the Sacred Heart of Jesus provide a more somber aspect to a devotion that has been practiced for centuries, but is most widely known because of the revelations Jesus gave St. Margaret Mary Alacoque in the 17th Century. He not only showed her His Sacred Heart beating with burning love for all humanity in a manner such as that depicted above, but gave her guidance into ways in which we could strengthen our love for Jesus through His Sacred Heart and grow in Holiness, such as receiving Him in Holy Communion in a state of grace on the First Friday of nine consecutive months. We are reminded in these invocations below, as in all prayers to our Lord’s Sacred Heart such as those listed in this essay, that Jesus being both God and Man has a human heart capable of immense love for us, a love great enough to suffer for our sins, as these invocations suggest, in ways we can’t being to imagine, emotionally as well as physically. Heart of Jesus, Who hast borne all our griefs, strengthen me. Heart of Jesus, Who hast weighed this sorrow before sending it to us, help me. Heart of Jesus, ever touched by the sight of sorrows, pity me. Heart of Jesus, beautiful in Thy sorrows, teach me to become holy by means of this affliction. Heart of Jesus, spending thyself for souls in the midst of Thy sorrows, make me unselfish in bearing mine. Heart of Jesus, troubled at the grave of Lazarus, comfort those who mourn. Heart of Jesus, softened by the tears of Magdalen, pity the sorrowful. Heart of Jesus, Whose sorrow was ever before Thee, teach us to united our griefs to Thine. 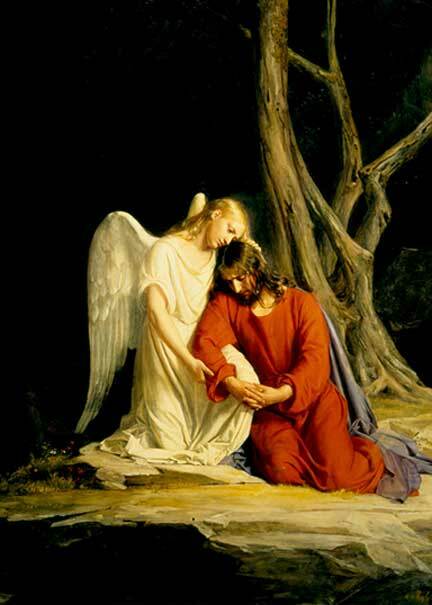 Heart of Jesus, agonized in Gethsemane, strengthen us in all the sorrows of life. Think also of the one of the shortest sentence in the Gospels, referring to Our Lord’s having a “troubled” heart at the grave of Lazarus before raising him from the dead: “And Jesus Wept” (John 11:35). Clearly in His Sacred Heart we see God not as some aloof uncaring figure indifferent and unapproachable to mere human beings. He’s clearly not one of those remote deities worshipped by misguided humanity for centuries. He does not exist to cast looks of scorn or pleasure and toss a few thunderbolts our way from time to time! In Jesus’ Sacred Heart, in His earthly ministry, and in various approved private revelations such as the ones He gave to St. Margaret Mary, we see Our Lord loving us and wishing to save us in ways we can’t fully imagine or comprehend! Note also, that when Jesus asks us to take up our crosses and follow Him as he does in scripture (Matt 16:24 and Luke 9:23) he is not asking us to do anything He wouldn’t do Himself. You can see that just looking at a crucifix. Yet, Christ asks us to help Him in our redemption by “offering up” our sufferings to His, so that with His help and grace, we may be “unselfish in bearing” them, as discussed here. This may seem like a tall order, especially when you’re in the midst of some great physical, emotional (or as so often happens these days, financial!) pain. But remember: You don’t have to bear your crosses alone. Ask Jesus to help you, in prayer. Look for support in your parish or other community. And, in imitation of Christ, help others to bear their crosses as well whenever possible. Jesus will be there with you, helping to heal you in your sufferings and the pains of others you help as well.